With all the stories, side stories, and TV shows (plus comics, novels, and audio dramas), there are plenty of stories to be told in the Star Wars Universe. However, we might have a movie about Wookies, one eventually became a novel, one where the Clone Wars led to the forming of the Jedi Knights, and I would like to see one just centered on the droids. ScreenCrush lists five Star Wars movies that were considered but never started. Posted by ShadowWing Tronix on May 11, 2018 in Movie Spotlight and tagged Star Wars. These sounded like some interesting concepts for movies. One thing with the Star Wars Universe, there’s an infinite possibility of films, novels, and comic books that could continue to appear on the scene. Personally, I’d like to see a movie that focuses on Jabba the Hutt and another movie that focuses on Yoda. For example, what was Yoda’s childhood like? What was Jabba’s childhood like for that matter? What were the turning points in their lives? Long live Star Wars! 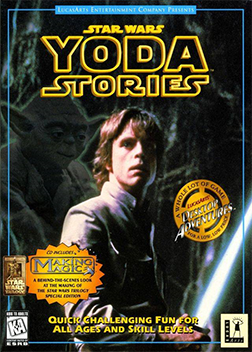 Did you ever play that Yoda Stories video game, Tronix? Only heard about them a couple of years ago.